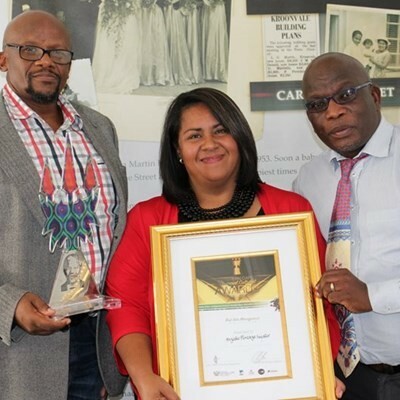 GRAAFF-REINET NEWS - The head of the local museum, Anziske Kayster, received the MEC’s Provincial Award for Museums and Heritage at a prestigious award ceremony held in East London on 24 February. The award is in recognition of her contribution to the conservation of heritage and specifically the restoration of Reinet House. Kayster, who received the award in absentia due to a family bereavement, said she was overwhelmed by the honour and extended her gratitude to Peter Whitlock, the chairperson of the museum board, who nominated her as well as Ansie Malherbe and Hans Hendricks, Chief Operations Officer of The Dr Beyers Naudé Local Municipality, who submitted written recommendations in support of her nomination. In her recommendation, Malherbe highlighted the fact that Kayster deserved the respect of her peers as she had proven herself to be a role model in the field of heritage conservation. She has also exhibited ongoing leadership, initiative and dedication towards this worthwhile cause. She conveyed her sincere gratitude to The Rupert Historic Homes Foundation who provided the funding which made the restoration of Reinet House possible. The head of the local museum, Anziske Kayster, received the MEC’s Provincial Award for Museums and Heritage at a prestigious award ceremony held in East London on 24 February. Credits to the The Advertiser.